On a certain level, extinction is all about energy. 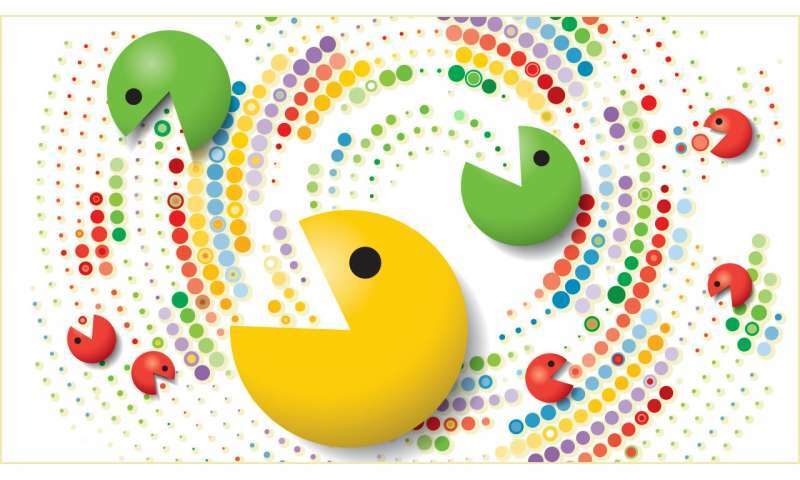 Animals move over their surroundings like pacmen, chomping up resources to fuel their survival. If they gain a certain energy threshold, they reproduce, essentially earning an extra life. If they encounter too many empty patches, they starve, and by the end of the level it's game over. Models for extinction risk are necessarily simple. Most reduce complex ecological systems to a linear relationship between resource density and population growth—something that can be broadly applied to infer how much resource loss a species can survive. This week in Nature Communications, an interdisciplinary team of scientists proposes a more nuanced model for extinction that also shows why animal species tend to evolve toward larger body sizes. The Nutritional State-structured Model (NSM) by ecologist Justin Yeakel (UC Merced), biologist Chris Kempes (Santa Fe Institute), and physicist Sidney Redner (Santa Fe Institute) incorporates body size and metabolic scaling into an extinction model where 'hungry' or 'full' animals, great and small, interact and procreate on a landscape with limited resources. "Unlike many previous forager models, this one accounts for body size and metabolic scaling," Kempes explains. "It allows for predictions about extinction risk, and also gives us a systematic way of assessing how far populations are from their most stable states." In the NSM, hungry animals are susceptible to mortality, and only full animals have the capacity to reproduce. Because animals' energetic needs change with body size, the researchers based their calculations for replenishment and reproduction on biological scaling laws that relate body size to metabolism. They found that species of different sizes gravitate toward population states most stable against extinction. The states they derived in the model reproduce two oft-observed patterns in biology. The first, Damuth's law, is an inverse relationship between body size and population density: the bigger the species, the fewer of individuals cohabitate in a given area. Within the NSM, this fewer/larger more/smaller pattern emerges because large species are most stable against starvation in small numbers, while small species can afford to reach larger population densities. The second relationship, Cope's rule, holds that terrestrial mammals tend to evolve toward larger body sizes. This NSM shows that, overall, larger animals with slower metabolisms are the most stable against extinction by starvation. It even predicts an energetically "ideal" mammal, robust in the face of starvation, which would be 2.5 times the size of an African elephant. "As we incorporated more realism into how quickly organisms gain or lose body fat as they find or don't find resources, the results of our model began aligning with large-scale ecological and evolutionary relationships. Most surprising was the observation that the NSM accurately predicts the maximum mammalian body size observed in the fossil record," explains Yeakel. Though the model doesn't account for predation, it does offer a dynamic and systematic framework for understanding how foragers survive on limited resources. "The dynamics of foraging and the interaction of body size in foraging and resource availability, these are all rich problems for which there is beautiful phenomenology," says Redner. "I hope some of this will have relevance in managing resources and ensuring species don't go extinct."